If you haven't heard of Create & Cultivate yet, you best learn now. Launched in 2012, it is one of the premier multi-city conferences geared towards women who wish to create and cultivate their ideal careers. Its founder, Jaclyn Johnson, started this as a way to inspire female entrepreneurs like herself. Once a blogger, she understood the ups and downs of being your own boss. She sought to encourage a community focused on job placement, networking, marketing, mentorships, and partnerships for others through this movement. The conference is designed to assemble and inspire the creative, the curious, and the entrepreneurial with mentoring sessions, workshops, and speaking panels with A-listers like Lauren Conrad, Chrissy Teigen, and the 2018 keynote speaker, Kim Kardashian. At the end, there is a hosted party decked out with confetti. This year's event took place in February at City Market Social House in downtown Los Angeles. Many big brands participated such as Urban Outfitters, Shoedazzle, LinkedIn, WeddingWire, La Croix, Quickbooks, Livestrong, and so many more. The guest speakers didn't end there. Our client, Elizabeth Stein, CEO of purely elizabeth., was also a panelist dolling out sage advice at this year's event. Provenance Rentals, along with some amazing vendor teammates, such as Upton Grey Floral and Cut It Lab, were super lucky to design and create the purely elizabeth. booth in the Lunch & Lounge area. Guest noshed on yummy provisions and sipped cocktails whilst our client offered healthy complementary samples of purely elizabeth. granola. Their products are not only delicious, but made from some of the best ingredients. They carry goodies that have probiotics, are grain-free, and chock full of healthy sustenance. Photo Credit: Sarah Meis for purely elizabeth. 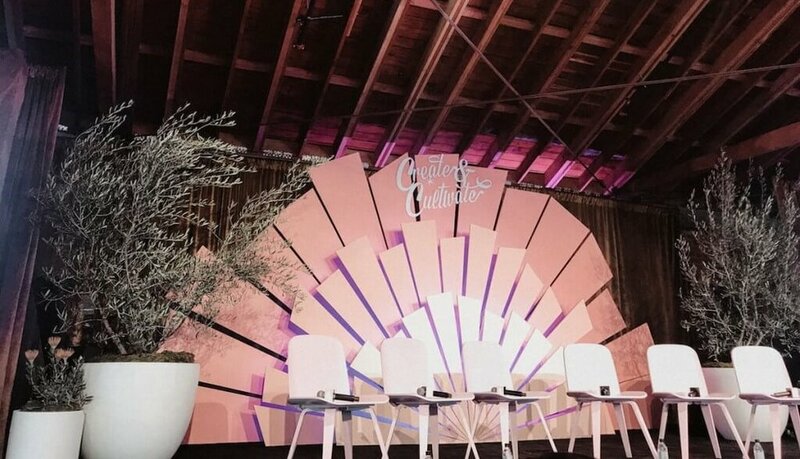 We had a blast constructing one of the prettiest sponsorship booths at Create & Cultivate for the purely elizabeth. brand. We came up with something unique, romantic, and timeless that transmitted the quality of our client's brand as well as our own. Instead of a donut wall, we fashioned a grandola wall: all in white with shelving to act as the backdrop for the booth. In addition, we built a rustic and romantic white bar with detailing in the front that was nothing like your typical expo booth. Plus, for those interested in renting our romantic bar for your next event -- there are two long storage shelves behind the bar to hold product, personal items, any glassware and more. Our granola wall will be converted into a donut wall as well. Our goal was to create something that the purely elizabeth. brand stood for: stability, uniqueness, health, well-being, balance, and beauty. We partnered with some extraordinarily talented vendors in order to execute overall look and feel to the booth. Working closely with Victoria from Upton Grey Florals we wanted only the best to add value to the booth: rentals and florals make for a very happy marriage. Upton Grey knew and understood the client's vision by arranging two crescent-shaped gatherings on each corner with pastel colors that paid homage to the purely elizabeth. brand. They also designed small arrangements for each shelf to highlight the beauty of the product and a satellite arrangement for the bar in a handmade clay sculpture vase. The pinks, oranges, and greenery helped make the packaging of the product pop and draw all sorts of interested attendees to the booth. The conference-goers loved it. The booth also stood out thanks to the custom cut logo by Kim from Cut It Lab. They worked tirelessly to individually laser cut the exact font of purely elizabeth. If you notice, it is jagged and not smooth. The natural, down-to-earth look we needed to execute the perfect feel for the brand. Not only where they a dream to work with, they delivered the individually cut letters to us. We installed each letter by stacking and centering them to finish off the overall look for Elizabeth and Sarah of purely elizabeth. The event was a smashing success; the brand was flawlessly promoted. The women in attendance not only networked and learned from the pros, but they also strolled around the posh pop-up market with all sorts of interesting female-owned brands and businesses, they also received rad gift bags, and took home inspiration to help them in their careers for a lifetime. If you couldn't make this year's event, be sure to keep up-to-date with the latest news and next year's conference. Tickets usually sell out as soon as they go up for sale, so be sure to act fast for 2019. We hope to see you there outdoing ourselves next year! Credits: Conference Booth Design + Rentals by Provenance Rentals | Floral Arrangement + Design by Victoria for Upton Grey Floral | Select Photos by thedoctorette.com, Sarah Meis, Alyssa Dawson | Logo by Kim for Cut It Lab | Conference by Create & Cultivate | Venue by City Market Social House | Client purely elizabeth.